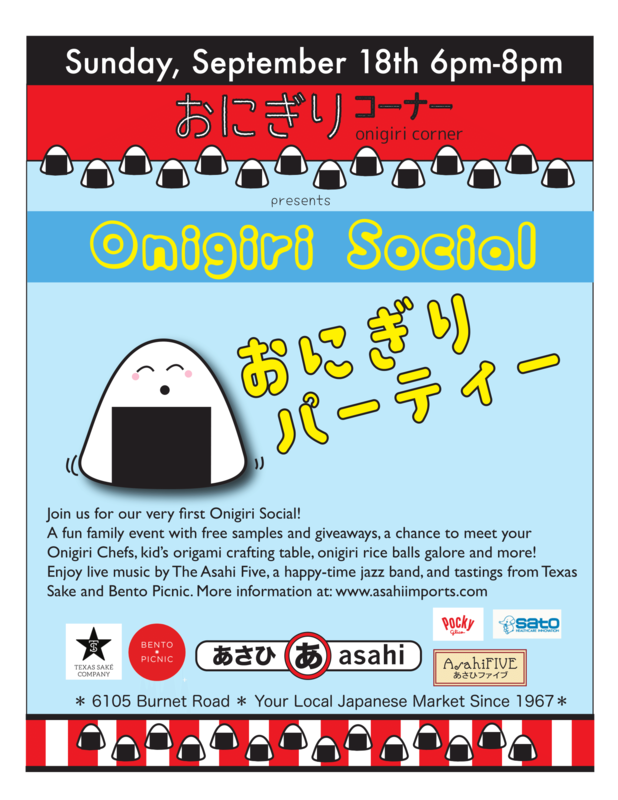 Join us for our very first Onigiri Social! A fun, family event with free samples and giveaways, a chance to meet your Onigiri Chefs, kid’s origami crafting table, onigiri rice balls galore and more! Tastings from Texas Sake Company, Bento Picnic, and of course, the Asahi Onigiri Corner. Enjoy live music by The Asahi Five, a happy-time jazz band featuring local musicians. Check out our Facebook event page to talk about the event and RSVP! Thanks so much for your interest in our store! We don’t currently have a list of our inventory, but if there’s anything you’d like to have shipped to you, you could contact us by the contact form on our site or by emailing us at storeinfo@asahi-imports.com and let us know what it is that you’re looking for. Then we can tell you if we have it, how much it is and how much it would cost to ship. If there’s anything else you’d like to know, just let us know! There are a ton of Asian stores in the Atlanta area. I will say they are not exclusively Japenese. Will there be an Onigiri party this year??????? Hi there, sorry for the late reply! We do plan on having an onigiri party again this year! It’ll be on Sunday, November 12th. We have a new post on the blog about it!